Verse 1: Shout to the Lord, all the earth,* sing now to His name, give glory to His praise (Ps 65:2). Verse 2: The voice of Your thunder was in the whirlwind;* Your lightning lit up the world (Ps 76:19). Verse 3: You have clothed Yourself in praise and splendor;* You robe Yourself in light as with a cloak (Ps 103:1-2). Verse 1: Mount Zion, the northern slopes,* is the city of the great king (Ps 47:3). Refrain: Son of God, transfigured on the mount,* save us who sing to You: Alleluia. Verse 2: And He led them to the mount of His holy place,* to this mountain, which His right hand had won (Ps 77:54). Verse 3: Mount Zion which He loved, He made His holy place;* as steadfast as a monolith (Ps 77:68-69). Verse 1(Soloist): Those who trust in the Lord are like Mount Sion which cannot be moved (Ps 124:1). 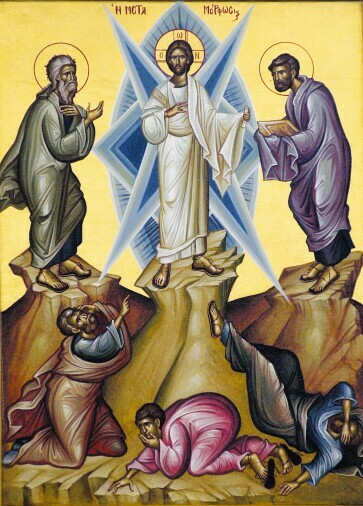 Troparion (Tone 7): You were transfigured on the mount, O Christ God,* showing Your glory to Your disciples as much as they could bear. * Make Your eternal light shine* also on us who are sinners,* through the prayers of the Mother of God,* O Giver of Light, glory to You! Verse 2 (Soloist): The mountains surround it, and the Lord surrounds His people now and for ever (Ps 124:2). Entrance Verse (Soloist): Lord, send forth Your light and Your truth, these have guided and led me to Your holy mountain (Ps 42:3). Kontakion (Tone 7): You were transfigured on the mount, O Christ God,* and Your disciples saw Your glory as much as they could;* that when they saw You crucified* they might know that You suffered willingly,* and might proclaim to the world* that You are truly the brightness of the Father. Prokimenon (Tone 4): How great are Your works, O Lord;* You have made all things in wisdom (Ps 103:24). verse: Bless the Lord, O my soul; O Lord my God, You are exceedingly great(Ps 103:1). Epistle: (2 Peter 1:10-19): Brethren, be all the more eager to confirm your call and election, for if you do this, you will never stumble. For in this way, entry into the eternal kingdom of our Lord and Saviour Jesus Christ will be richly provided for you. Therefore I intend to keep on reminding you of these things, though you know them already and are established in the truth that has come to you. I think it right, as long as I am in this body, to refresh your memory, since I know that my death will come soon, as indeed our Lord Jesus Christ has made clear to me. And I will make every effort so that after my departure you may be able at any time to recall these things. For we did not follow cleverly devised myths when we made known to you the power and coming of our Lord Jesus Christ, but we had been eyewitnesses of his majesty. For he received honour and glory from God the Father when that voice was conveyed to him by the Majestic Glory, saying, ‘This is my Son, my Beloved, with whom I am well pleased.’ We ourselves heard this voice come from heaven, while we were with him on the holy mountain. So we have the prophetic message more fully confirmed. You will do well to be attentive to this as to a lamp shining in a dark place, until the day dawns and the morning star rises in your hearts. verse: Yours are the heavens, and Yours are the earth (Ps 88:12). Irmos (Tone 4): Your giving birth was revealed as incorrupt;* for it was God who came forth from your womb;* He appeared on earth in the flesh, and made His dwelling among us. * Thus, O Mother of God, all of us magnify you.